A retired sheriff and his wife go after their young grandson in a riveting tale of familial love and its unexpected consequences. 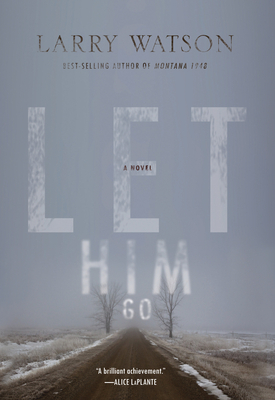 Let Him Go, Larry Watson's ninth book, returns to big sky country in mid-century America but, with the pervasive menace of a small town family gone wrong and a shocking and deadly ending, this novel charts new territory for the author and provides a powerful dose of suspense for the reader. It's been years since George and Margaret Blackledge lost their son James and months since his widow Lorna took off with their only grandson and married Donnie Weboy. Margaret is resolved to find and retrieve the boy -- while George is none too eager to stir up trouble. Soon, the Blackledges find themselves entangled with the entire Weboy clan, who are determined not to give up the boy without a fight. The author of many novels, including Montana 1948 and Orchard, Larry Watson is the recipient of the Milkweed National Fiction Prize, among numerous other prizes and awards. He teaches writing and literature at Marquette University and lives in Milwaukee.